I stumbled on new (to me) and very good cigars at some reasonable prices. Some of these I’ve known but never bought as their prices are normally over my limit. But a deal is a deal and I couldn’t let them pass. These include the “T” which I have already reviewed here, and a couple of Punch sticks (the Elite and Bareknuckle) which are never very expensive but came to me at a very low price. Also the Surrogates “Cracker Crumbs” which I think is pretty good. 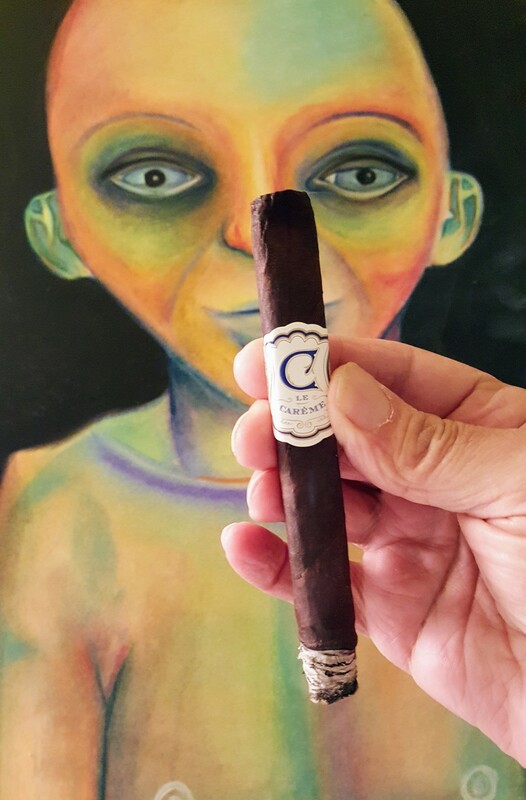 Another discovery, AJ Fernandez’s “Last Call” (I love AJF’s blends), like the Surrogates, pretty darned good for $4.25/stick, and finally, the two best of all, My Father’s “La Opulencia”, and for this review, the Crowned Heads “le Careme” both costing about $6.25/stick after discount (all prices at the box level)! I will try to review them all at some point (and will place links here when I do) but the short and sweet of it is that they are all good cigars! My source for all of these other than the Punch was the web site for Cigar and Pipes. They don’t give an address, but they are in the U.S. East Coast timezone. Any order over $80 is shipped free by USPS priority mail. I get these sticks (on the West Coast) 3 mail days after ordering! Get on their mailing list and look for their discounts. 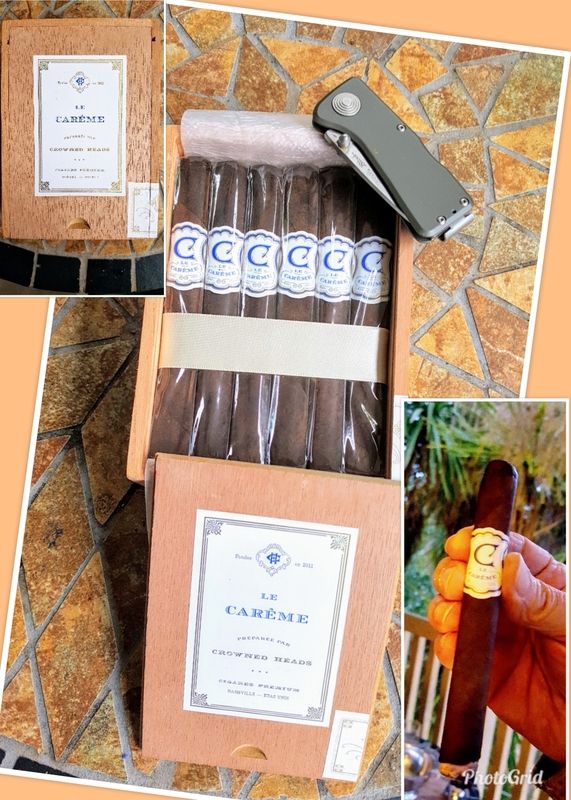 I have smoked two vitolas of the “le Careme”, the 5.5″ x 42 box pressed corona (pictured) and also the box pressed robusto at 5″ x 48. The flavor profile is the same. The robusto (3 of them) came in a sampler. The folks at Cigar and Pipes will send a sampler (in my case other Crowned Heads cigars) for every two or three boxes you order. I didn’t ask for them. Great service, and a great store! Construction: The wrapper is slightly oily, toothy, and dark brown shading almost to black here and there along its length. The first stick I smoked was a very difficult draw, close to plugged, but I managed to free it up enough to smoke it. I’ve had 5 more since and they were all fine. Maybe a little tight for me, but only a little. I’m one of those smokers who prefers a loose draw, so for many of you these would be just right. The robusto has a somewhat looser draw. Pack is firm and even all the way along the stick. For a smallish vitola, these are heavy in the hand, a densely packed cigar, explaining the tight draw. There are no veins in the wrapper, and the seams are well done. The stick produces a lot of creamy smoke all the way along. Smoke time about an hour and 10, a slow burning little cigar! Crowned Heads gets an “A” for construction here. Cold aroma: Strong black tea, manure, barnyard. A very rich and rewarding cold aroma! Light it up and you get some pepper along with a sweet flavor reminding me of Melba Toast and butter. As it smokes you get brown sugar, dried fruit, dry chocolate, cedar, and something that reminds me of salty ocean air. The burn line stayes pretty straight all the way along with a few minor corrections. In the second half there is a little more pepper and the stick adds something minty while all the other flavors and sweetness remain. The smoke begins at about a medium strength and gets a little fuller as it smokes. Superb, the cigar keeps all of these flavors down to the last half inch, the mark of a great stick! My score on these comes out to “A+”, a really good cigar and another winner for Crowned Heads!